Location: Miass, Urals, Russia. Scale: 10 x 8 cm. Comments: Bright red ruby corundum crystals in white marble matrix. 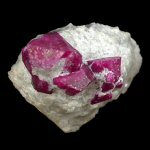 Location: Jagdalak (Jagdalek; Jagdalik) Ruby Mine, Sorobi District, Konar (Kunar; Konarh; Konarha; Nuristan) Province, Afghanistan. Scale: 4x3.5x3 cm.